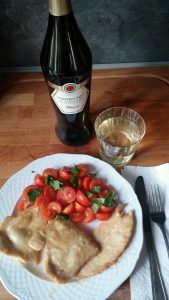 How did I discover Scaloppine Italian Chicken Recipe? 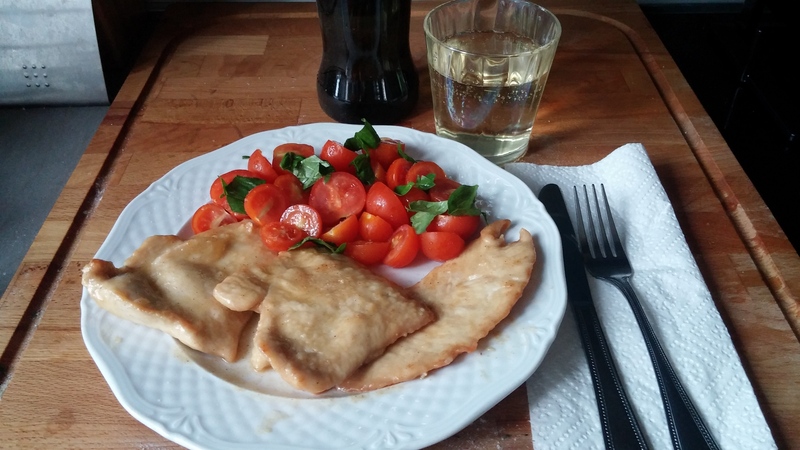 Let me tell you about the first time I have tasted Scaloppine Italian chicken recipe. Years passed and I have forgotten the name, but not the taste of the simple but delicious meal. It was early spring and I was working my last months in a construction company in Rome. One day I was approached by a woman from administration office. Knowing that I’m from Croatia, she invited me to come to her home for lunch and meet her daughter. Being Croatian descent she desired that her children would learn the language of her grandparents. She thought if they would meet someone their age, it would be easier. I was happy for the opportunity to meet new people and I have gladly accepted the invite. Arriving to their big home I was greeted by the girl and the tall black man. She told me that he will cook for us. Mmmm… food. 🙂 He didn’t talk much. Just asked fish or chicken? Chicken, I would like some chicken, please. I have to be honest and tell you that I don’t remember what was the girls name or how she looked like, but boy do I remember how I felt eating the chicken. It was juicy, a bit tingly, soft, moist and it seemed to have some kind of a glaze all over. The aroma was amazing and I was eating it slowly, wishing for it to last as long as possible. 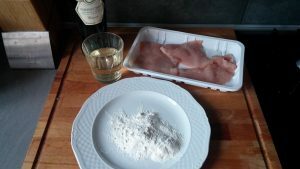 Moving to Bergamo I have learned the recipe how to prepare scaloppine Italian chicken and now I’m passing it on. For this meal use your usual amount of chicken breasts. I cook for two, but often I make too much, so we eat it for several meals. 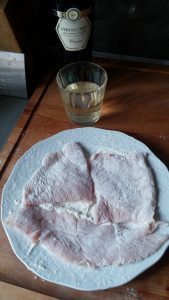 Slice the chicken breast into nice thin slices. The Scaloppine I ate in Rome was a thin slice of both parts of chicken breasts, so it looked like a big heart on my plate. I must admit I practical and don’t have such a big pan to fit two big parts at the same time. So I do the practical thing. I slice the chicken breasts on two parts and then I make nice long slices. Roll the chicken in the flour (I use ordinary white flour) and tap to remove the excess flour. Let it sit on the plate while you heat up the pan. I use non sticky frying pan in which I add extra virgin olive oil and a small cube of butter. Heat up slowly allowing butter to melt and get mixed with oil. Don’t wait too long as it will start to burn and butter will foam up. When oil reaches it perfect temperature add chicken slowly into the pan. 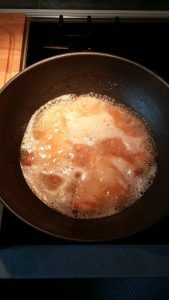 To fry it use medium heat in order not to burn it but to cook it until you get rich golden color. TIP: When I’m preparing large quantity of chicken I would simply do several rounds. Slices that are cooked I remove on a plate and add to the pan those that need to be done. Later on I unite them all for final touches. In our last step we will add dry white wine. I usually use between 1 and 2 cups, depending on the amount of chicken. TIP: The best way to measure the wine quantity is to make sure you cover the chicken completely in wine. Now, lower the heat and let it simmer until almost all the wine evaporates. The wine will make the chicken tender and as alcohol evaporates it will only leave the amazing wine aroma. TIP: In case you are avoiding the wine you can use lemon juice as a substitute. 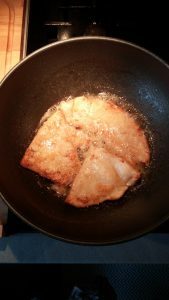 Now its you turn of making scaloppine Italian chicken recipe! Let me know if you would like to see video of me doing it.